Audrey was one of the earliest members of the Society and we were always intrigued why she came all the way from Gloucester to attend meetings. She was also the character who would respond to an appeal when the Society was in need and for a year she took on the role of Programme Secretary, displaying all her professional talents. Audrey was not, however, a native of Gloucester but was born in 1928 in Birmingham, where her father worked as a switch-gear fitter in Perry Barr; she spent her early life in Kingstanding. As with so many, her contact with Gloucestershire was established when her older sister, Jean, was evacuated with Aston Commercial School to Cinderford in the Forest of Dean. Jean was initially very homesick, so the rest of the family would visit her whenever possible. Audrey also attended Aston Commercial School but the air raids had declined so that the school had returned to Birmingham. 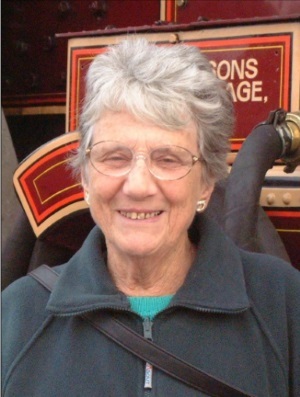 Audrey was a very sociable girl and was involved with the Girl Guides and Church Youth Club. With her sister, she cycled for miles until, while youth hostelling in Gloucester, an American tank transport accidentally ran over her bike. That ended biking! When she left school she was employed as a shorthand typist by a manufacturing silversmith, mostly making parts for SU Carburettors, as part of the war effort. During her visits to the Forest, she met Mervyn Burris, a radio engineer and former member of the Long Range Desert Group in the North Africa campaign. Married in 1948 when Audrey was 19, they moved to Birdlip, where Mervyn worked at the radio station for the Ministry of Aviation. Unfortunately he died in 1951, aged 28, as a result of peritonitis, leaving Audrey a widow at the age of only 23. She returned to Cinderford to be close to the Burris family and found work as a shorthand typist with a firm of solicitors. This started an association with the legal profession that lasted until her final retirement in 2012 - at the age of 84! Whilst living in Cinderford she met Colin Pound, a building surveyor with the County Council, and they married in 1954. They soon bought a house in Hucclecote, to be close to Colin’s office. Audrey stayed at home to look after their two children, Adrian (1957) and Lorraine (1960). She only resumed with agency work - school holidays were sacrosanct so that their home life would be enjoyable. Colin’s health began to deteriorate and in 1972 he was diagnosed with Parkinson’s Disease. Soon he was forced to retire; Audrey was left with two teenage children and an ailing husband. She also took a permanent job with the solicitors Haines and Sumner in Gloucester. Over the years, as her legal knowledge developed, she progressed from being a secretary to a probate clerk. Her mother also moved into her home and, as her health deteriorated, Audrey and her sister nursed her for her last three months. Juggling parttime work and running a home, she also cared for Colin until he died in 1987, aged only 62. Audrey and Colin had been early members of the Cheltenham Parkinson’s Disease Society and, after his death, she took a much more active role in the organization as secretary, also arranging the programme of events and writing the newsletter. She was also a great moral support to another Society member, David Willavoys, who suffered from the same illness. After Colin’s death she could follow more of her interests, one of which was history, and she became one of the founder members of the THS in 1991, serving briefly on the committee until her commitment to the Parkinson’s Disease Society absorbed so much of her time. Macular degeneration caused failing eyesight and an inability to drive in the dark forced her to resign from PDS. When diagnosed with terminal cancer, Audrey was typically determined not to be a burden and insisted on entering Millbrook Lodge Hospice. Until the end of her life, she still enjoyed outings. We are very grateful to Adrian for compiling this moving memoir that explains so much about the context of Audrey’s much appreciated role in the Society.